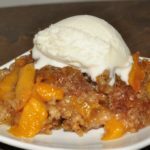 This is probably the easiest peach cobbler recipe you’ll ever make. That, plus the awesome reaction you get when people try it will keep you coming back to make this again and again. Pour peaches and juice into a 9” x 13” pan. Spread dry cake mix evenly over top. Slice butter VERY thin and spread out on top of cake mix over entire surface of pan (otherwise, the cake mix will not bake where there is no butter). Bake for 40 minutes in 350 degrees oven. Top should be slightly brown, or you can bake for a little longer.